The information leaks ahead Google's Android event next week continue to flow, with the latest thanks to support manuals on LG's Australian and UK websites. While we're already familiar with the phone's hardware thanks to a detailed Belarusian review, the manuals confirm it is going to be called the Nexus 4, and that along with the 8GB version we've seen there will definitely be a 16GB edition available. As you can see above, it also includes an induction coil for wireless charging and excludes any microSD slots for additional storage. 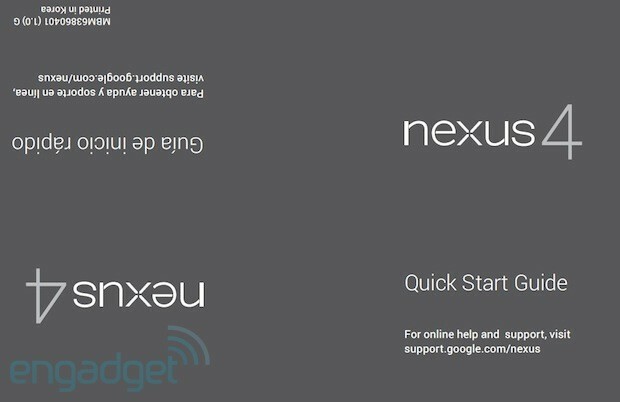 This all comes after two separate Nexus 10 leaks earlier today, as well as a report by Wired of a lost Nexus 4 recovered in a San Francisco bar (sound familiar?) last month. Hit the source link below to check out the LG E960 PDF for yourself (you may need to select the "show all" radio button), although there's only a few diagrams and support info waiting within.